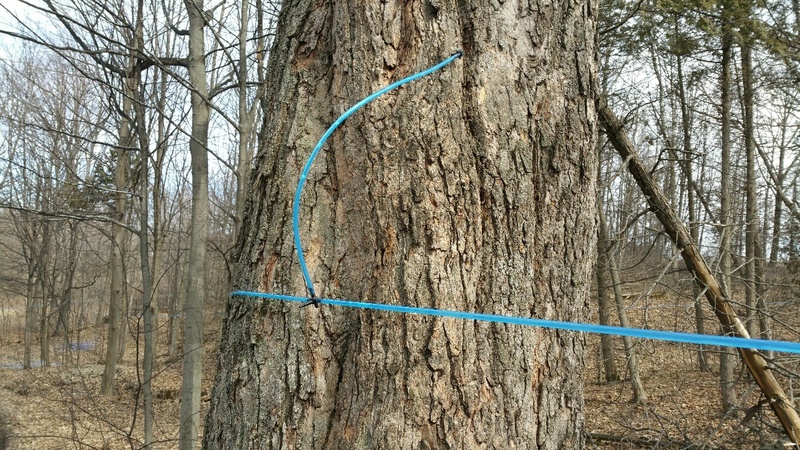 The first big event of the season in Prince Edward County celebrates the area’s bounty of Sugar Maple trees (see Trees #3, Sugar Maple) and the number of farms that tap it and make it into syrup. As loyal residents of the County and as farmers with maple trees that we hope to tap someday, we wanted to take part. Jonathan and his family were with us from Toronto so we went together to visit some of the farms listed. The day was sunny but cold and windy so we ended up going to only two farms but they were interesting. The first featured a number of farm animals in addition to the sugar shack. I am a bit familiar with that farm and was interested in seeing their hoop barn and the kids were interested in the animals, especially the new lambs. The syrup evaporator in the sugar shack to the right was not operating when we were there but the hoop barn was open and we joined the throngs of people visiting it. 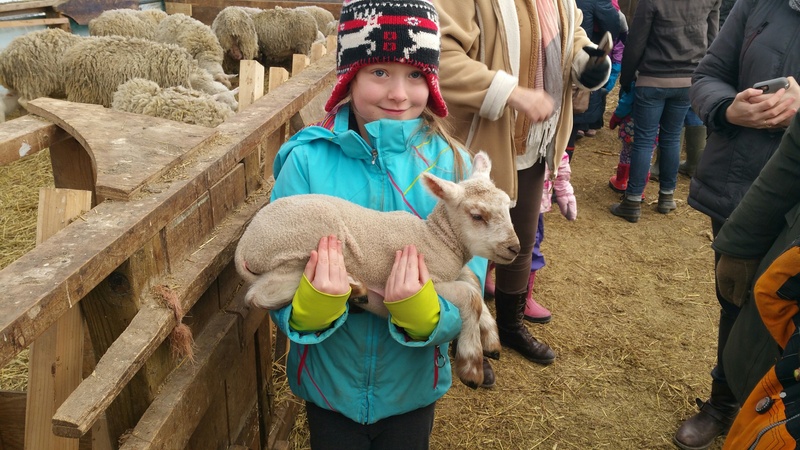 The crowds were thick but the grandchildren had the opportunity to hold a lamb which had been born earlier in the week. 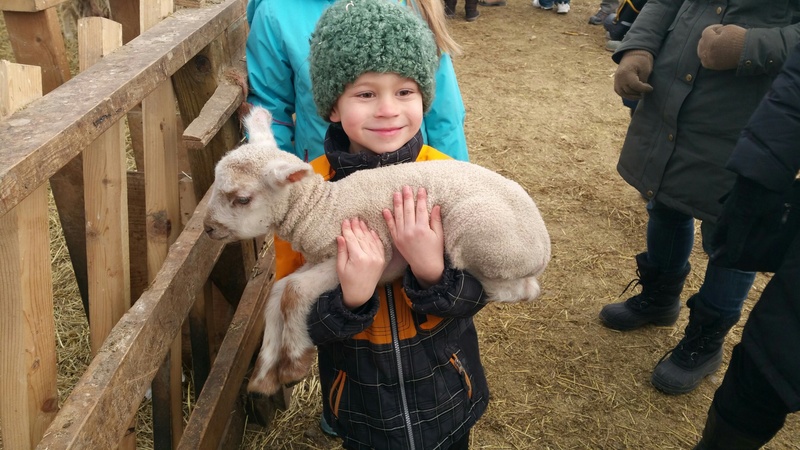 If our plans to add goats and pigs over the next month or so come to fruition, the grandchildren will become quite used to being with farm animals but holding this lamb was new experience for them. At the second farm, the oldest producing maple syrup farm in the County, we were able to tour their sugar bush. I found it fascinating because the system they used might work in some areas on our property. They had created a vacuum system without using a pump. Instead, the system used gravity to create a similar effect; the trees were on a hill and had been connected with blue tubing that steadily worked its way down the incline. 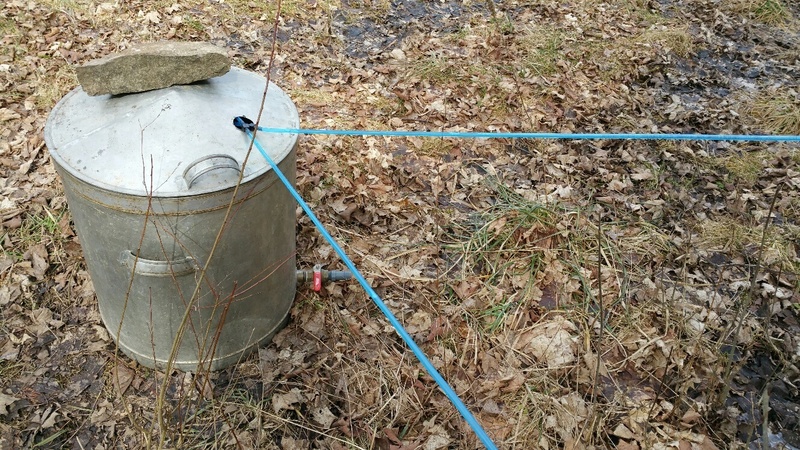 We could see the sap inside the tube gradually working its way down towards a container at the bottom of the hill. The farmer told me that it is far more effective than using buckets and much less expensive than using a pump. Given that most of our maple trees grow on a slope, we might be able to do something similar. 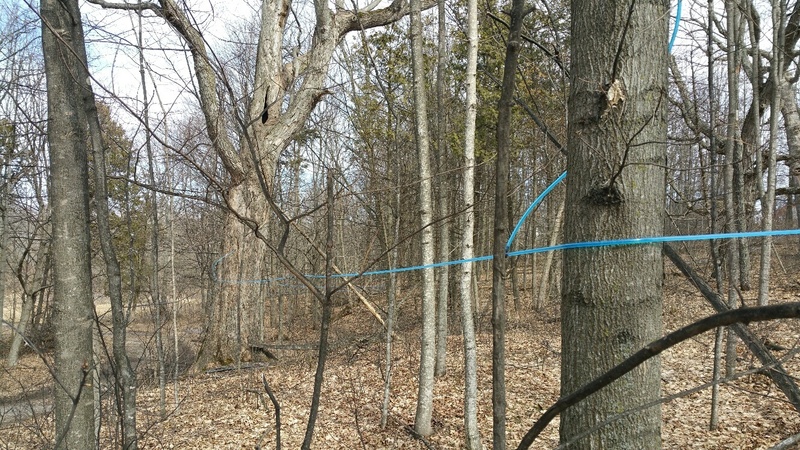 Each tree is tapped, and its sap flows down the short tube to the main tube. The tubing went from tree to tree, but always down hill. The tubes fed into this large container (probably 25 gallons or more) at the bottom of the hill.